Stephens Heating & Air Conditioning, Inc.
Click HERE to see Tax Credits available for geothermal heat pumps. Geothermal (Ground Source) heat pumps are becoming more and more popular in our area. Many people are discovering the benefits of harnessing our Earth's constant ground temperatures. 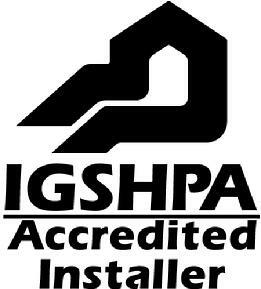 Stephens Heating is proud to be one of very few dealers in Oregon who is certified by the International Ground Source Heat Pump Association for the installation of these units. Ground source heat pumps can be installed on an open loop or a closed loop system. These configurations are described in detail below. We install ClimateMaster and GeoComfort brands for our customers' ground source needs. With many models to choose from, these brands have proven to be reliable and priced moderately for their high performance. Click here to read about how Geothermal Heat Pumps work! Closed loop systems are becoming the most common geothermal configuration. If properly installed, they are economical, efficient, and reliable. A water/anti-freeze solution is circulated through a continuous buried pipe. The length of loop piping varies depending on ground temperature, thermal conductivity of the ground, soil moisture, and the size of unit needed for your home. This is the most used configuration here at Stephens Heating. Horizontal closed loops are most cost-effective for small installations, particularly for new construction where sufficient land area is available. These installations bury pipe in trenches dug with back-hoes or chain trenchers. Up to six pipes, usually in parallel connections, are buried in each trench, with a minimum separation of one foot between pipes and ten to fifteen feet between trenches. Often "SlinkyTM" coils -- overlapping coils of polyethylene pipe -- are used to increase the heat exchange per foot of trench, but require more pipe per ton of capacity. A ground loop is only as good as its connection to the ground. Therefore, horizontal installations require careful trench backfilling. The backfill must be free of sharp rocks that could harm the pipe, and the pipe needs maximum contact with the ground. And beware! Your lawn or yard will not look the same after a ground loop installation, but most people consider the mess worth while. Vertical closed loops are preferred mostly for large commercial buildings and schools because there is not enough land available for a horizontal installation. Vertical loops are also used where the soil is too shallow for trenching and they tend to minimize the disturbance to existing landscaping. For vertical closed loop systems, a U-tube is installed in a well drilled 100 to 400 feet deep. Because conditions in the ground may vary greatly, loop lengths can range from 130 to 300 feet per ton of heat exchange. Multiple drill holes are required for most installations, where the pipes are joined in parallel or series-parallel configurations. Pond closed loops are a special kind of closed loop system. Where there is a pond or stream that is deep enough and with enough flow, closed loop coils can be placed on the bottom of the pond. Fluid is pumped, just as for a conventional closed loop, where conditions are suitable. The economics are very attractive and no aquatic system impacts have been shown. Open loop systems are the simplest. Used successfully for decades, ground water is drawn from an aquifer through one well, passes through the heat pump's heat exchanger, and is discharged to the same aquifer through a second well at a distance from the first. Generally, two to three gallons per minute per ton of capacity are necessary for effective heat exchange. Since the temperature of ground water is nearly constant throughout the year, open loops are a popular option in areas where they are permitted. Open loop systems do have some challenges: (1) Some local ground water chemical conditions can lead to fouling the heat pump's heat exchanger. Such situations may require precautions to keep carbon dioxide and other gases in solution in the water. Other options include the use of cupronickel heat exchangers and heat exchangers that can be cleaned without introducing chemicals into the groundwater. (2) Increasing environmental concerns mean that local officials must be consulted to assure compliance with regulations concerning water use and acceptable water discharge methods. For example, discharge to a sanitary sewer system is rarely acceptable. water can be "bled" from the system, to allow ground water to restore temperatures to the normal operating range.